Commercial Solutions – Comfort Supply Inc.
We supply all the standard installation and technical services you expect from a well-established HVAC distributor. These are services undertaken during new construction, renovation and remodeling projects. Additionally, we also supply enhanced services that only a select few distributors can offer. We offer extensive knowledge of leading edge systems such as variable refrigerant flow (VRF), heat recovery, ductless split systems, radiant heating, snow-melt, geothermal and hydronics. From design through startup and beyond, our Commercial Team at CSIpgh is fully capable of providing the service and support our wide range of customers need to get the job done – right and once. We can help by assisting engineers and contractors with application advice and system design for incorporating products with exceptionally low operating costs. We offer technical support at every stage of a project: from installation to enhanced troubleshooting, let our experts help you. Click HERE to download our Spring 2019 Training Flyer. You can also download driving directions to our MAIN and EAST locations! Comfort Supply, Inc. continually endeavors to be an HVAC industry leader in customer service, technical expertise and product knowledge while retaining a family business culture dedicated to providing tools and opportunities for customers and employees to be successful. 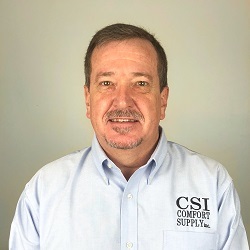 Comfort Supply, Inc. was founded by Frank Heckler in 1985 to deliver high quality HVAC solutions to the Western Pennsylvania market. Their heating heritage goes back to the early 1900’s when the Heckler family manufactured and installed over 30,000 coal and gas furnaces during the inception of central residential heating. CSIpgh is now owned and operated by David Heckler and his son Brendan, carrying the Heckler family into their fifth generation of HVAC expertise.